Grating the cold butter into the flour mixture is a bit unconventional, but it works! It’s easiest to start with a fresh stick of very cold butter, unwrap it part way, and grate until you reach the 2 Tbsp mark on the wrapper. 1. Preheat the oven to 500. 2. In a large bowl, cut the shortening into the flour using a pastry blender or two knives until it forms coarse crumbs. 3. Using a flat grater or box grater with large holes, grate the very cold butter directly into the flour mixture. Quickly toss the two together with a fork. 4. Drizzle in the buttermilk as you stir the biscuit dough together. Stir only until no dry flour clings to the bottom of the bowl. Do not over-mix. 5. Turn the dough onto a lightly floured surface and sprinkle just a little flour onto your hands as well as the top of the dough. Pat the dough to flatten the top. 6. With a bench scraper or metal spatula, fold the dough in half from side to side. Re-flour the exposed work surface, then fold the dough in half from bottom to top. Repeat the folding sequence two more times. 7. Pat the dough out to 1/2″ thick. 8. Using a 2 to 2 1/2 inch biscuit cutter, cut the dough into 10 to 12 biscuits, using the scraps as needed. Do not twist the cutter. This will seal the edges of the biscuits, preventing them from rising into flakey layers. 9. 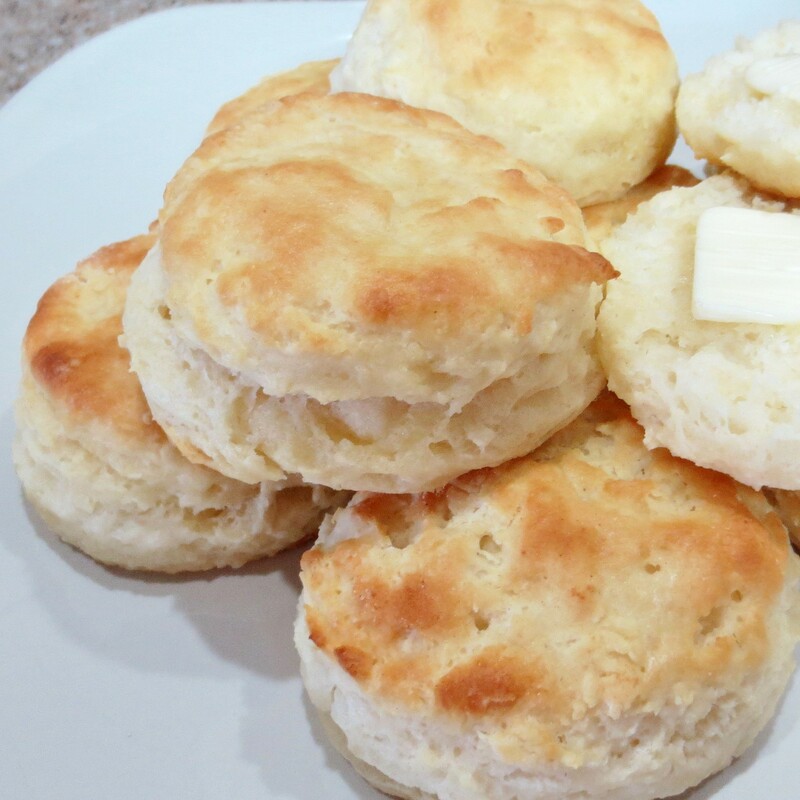 Place the biscuits 1/4 inch apart on a baking sheet. 10. Bake for 10 to 12 minutes, or until nicely browned. If desired, brush the tops with melted butter. Best served hot.